Several Italian MEPs have voiced concern and criticism after a lawmaker from Matteo Salvini’s ruling Lega party hinted at the possibility of removing an EU civil servant from his duties, following an argument with him on Twitter. On Monday (18 March), Italian MP Claudio Borghi had a falling out on Twitter with EU official Maurizio Molinari, a press officer at the Rome office of the European Parliament. Borghi, who chairs Italy’s lower house budget committee, is Lega’s economic spokesman and a prominent voice within the party against the single currency. He has also suggested on several occasions that Italy should leave the EU. The bone of contention was an October 2018 Eurobarometer poll published on the European Parliament’s Italian Twitter account, which reported that 65% of Italian people are in favour of the euro. Borghi accused those who run the account of the European Parliament and Molinari personally of spreading pro-EU propaganda ahead of the May EU elections by sharing on social media only the positive outcomes of surveys that the Parliament itself had carried out. After a long back and forth, Lega MP warned the EU official in a tweet: “I don’t think you are clearheaded and fit for your role. We will make sure to point this out to the new European Parliament Bureau after the elections,” alluding to Molinari’s removal. Molinari defended himself by saying he had passed three stages of the EU selection process to get his job. Borghi kept on attacking Molinari by digging up old tweets where Molinari had criticised Italian politicians such as Salvini, Beppe Grillo and Silvio Berlusconi, as evidence of Molinari’s impartiality. Most of those tweets actually date back to 2013, when Molinari worked as a journalist and not as an EU civil servant. The European Parliament President, Italian Antonio Tajani, was repeatedly asked to take a stance during the day and came up with a tweet later in the afternoon in defence of the EU official. 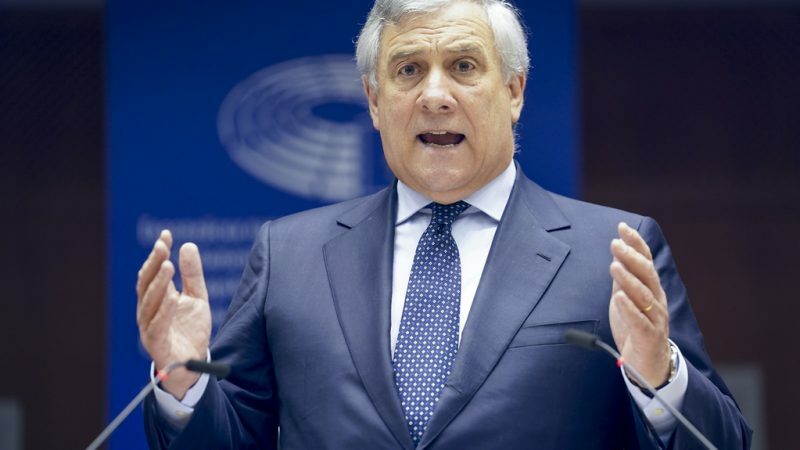 “I defend the autonomy of the institution which I chair, and I strongly reject any threat,” Tajani said, adding that it is not up to Italian politicians to threaten EU officials with removal for having given news or expressed opinions that they do not like. The first to voice criticisms against Lega’s lawmaker was the Vice President of the European Parliament, David Sassoli, also an Italian, who released a press statement condemning the issuing of “proscription lists” before the elections. “Perhaps it might not be clear for Borghi yet, but I would remind him that the Parliament is not his property or a dependant of Lega,” Sassoli said, adding that he will defend the independence of the European Parliament and its employees from this “vulgar and militant assault”. The Brussels delegation of the Five Star Movement, Salvini’s coalition partner in the Italian government, also condemned Borghi’s intimidation and asked him to apologise. “The words of Claudio Borghi on Twitter against an employee of the European Parliament are absurd and out of place. Our solidarity goes out to Maurizio Molinari,” Five Star MEPs said in a note. Contacted by EURACTIV, socialist MEP Brando Benifei also asked Borghi to apologise immediately. “His threats of purging Maurizio Molinari are very serious and go beyond a simple political diatribe,” Benifei told this website.